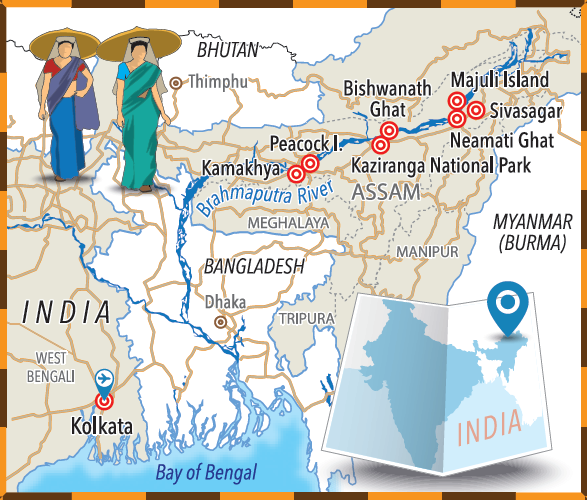 Take a trip down the mighty Brahmaputra and discover some of India’s most amazing sights. River cruisers will know the joy of visiting vineyards, medieval towns, Baroque cathedrals, breweries and Christmas markets as they sail the waterways of Europe, but, as I am fast discovering, things are a bit different on this cruise on the Brahmaputra in India. On this river you start the day with yoga or a nature walk, visit tea plantations, Hindu temples and monasteries, see paddy fields, rhinos and elephants — even a tiger if you are lucky. And eat very hot chillies! The river is such a well-kept secret that when I told friends I was going on a cruise on the Brahmaputra, they looked at me blankly. The Brahma-what? That’s a shame because it is one of the most exciting waterways in the world, blazing such a trail through Assam in northeast India that it carries off anything in its path. by a pilot boat and there are four dredgers on standby in case the river becomes impassable), while Majuli, once the largest inhabited river island in the world, is being eaten away at an alarming speed. 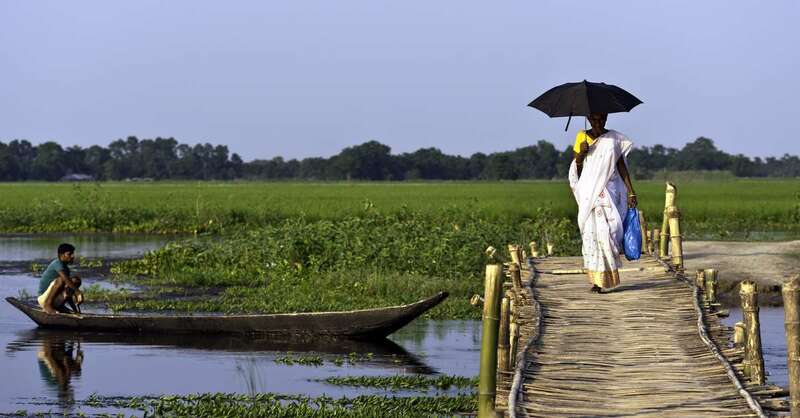 Just four years ago Majuli covered an area of 1,250 square km; now it is just 520 square km, and unless the government does something it will soon disappear completely. Unfortunately it seems that no one knows what to do because this river is a wild child that does not want to be tamed. “I have nothing but respect for this river,” Sanjay Basu told me. His company, Far Horizon Tours, built and operates the Mahabaahu. With room for just 46 passengers, she is a perfect companion for this voyage of discovery through Assam – comfortable, friendly and with a delightful Indian crew who can’t do enough to look after you. I had what I can only call an access-all-areas Ayurvedic massage with Raj (not recommended for anyone who wants to preserve their modesty!) and learned about the history, wildlife and vagaries of the river from Venkatesh (call me Venky), a naturalist travelling with us. The only male river in India (the name means Son of Brahma in Sanskrit), the Brahmaputra rises near Mount Kailash in Tibet, winds its way 1,300km east through the Himalayas, and then curls round, racing through the deepest canyon in the world, before heading south through Assam and joining the Ganges in Bangladesh. Its total length is 2,980km. Some 50 per cent of the monsoon rainwater each year falls in its valley, and almost half of the meltwater from the Himalayas also dumps into the river. During low season it is up to 10km wide; during monsoon season, from June to September, it can be three times that width. At that point people and animals have to move to the safety of higher ground, and the river is no longer navigable, so Mahabaahu has to be laid up. My cruise was a one-week sailing downstream from Nimati Ghat to Guwahati, which I reckon is the best way to go, as Mahabaahu speeds down with the current instead of battling against the flow. You not only see more but also start the holiday with a few lessons in the history and culture of the region, as well as getting a taste of the local driving, which is more than a little exciting at times! In theory drivers in Assam must pass a driving test; in practice I reckon all they really need is a good horn as it is used incessantly to warn other road users – whether cars, lorries, motorbikes, pedestrians, dogs or goats – of their presence. As we drove from the dock in Nimati to the city of Sivasagar on the first morning of the cruise, I noticed coaches and lorries emblazoned with the words Good Luck. That says it all! Sivasagar was once the home of the Ahom dynasty, which ruled Assam for almost 600 years from 1228 to 1826. It was pushed out by the Burmese, who in turn were pushed out by the British. We admired engravings on the walls of their ruined palace, visited a royal pavilion that Ahom generals used for state meetings and trysts with their mistresses, and joined worshippers celebrating Lord Shiva day at a Hindu temple. I found myself among crowds shuffling into the dark inner sanctum (bare feet only please), took a few gulps of air thick with incense and decided to head back outside. The locals exit the temple backwards, praying all the time; I preferred to look where I was going. The next week was full of wonderful experiences. I spotted hoopoe birds, owlets and vultures on an early-morning nature walk with Venky, and tried yoga on one of the sandbanks with Neena, the cruise director. “It’s all about breathing,” she explained, as we stretched, bent and twisted while amused walkers looked on. I climbed into one of the makeshift stilt houses inhabited by the Mishing tribe (there is no electricity, and the floors are slatted bamboo because they are likely to be washed away during the monsoon), learned to cook egg pakodas and posed for pictures with young Indians armed with mobile phones, for whom Westerners are still a novelty. On Majuli Island, we witnessed a prayer meeting by a religious order of Neo-Vaishnavite monks, a sect that broke away from Hinduism in the 15th century and worships Vishnu instead of Shiva. I always thought monks were quiet, pensive folk, but not these guys. They banged drums, clashed cymbals and danced and swayed, trance-like, as they prayed to their god. Still on Majuli, in a riverside clearing we watched a troupe of actors perform an episode of the epic tale Ramayana. This was more my cup of tea. In a nutshell Sita, the heroine, is captured by the demon king Ravan, who stole the show with his fierce features, wicked laugh and a seriously awkward costume with nine heads and 18 arms! He tells Sita that if she does not agree to be his wife he will eat her. It’s a tough choice but happily she never has to make up her mind as she is rescued from Ravan’s evil grasp by her husband Ram and his army of monkey warriors. And then there was the icing on the cake of this trip – Kaziranga National Park, home to one-horned rhinos, elephants, water buffalo and swamp deer and, most exciting of all, about 100 Bengal tigers. First we went wildlife spotting on a boat safari along the eastern reaches of the park and were treated to fleeting glimpses of shy Ganges dolphins, turtles, colourful kingfishers, pond herons and a fierce-looking water buffalo wallowing in the mud. I was keeping a lookout for a tiger but sadly none came out for a selfie. 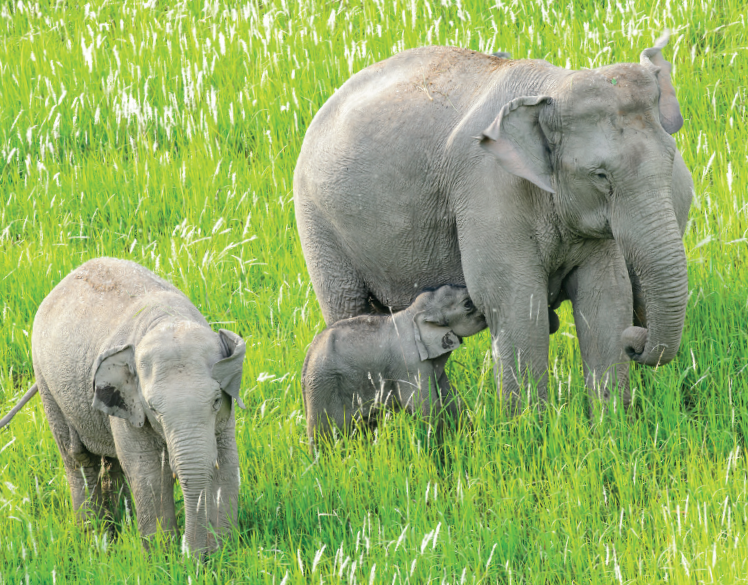 Two days later, after a 3 am alarm call and a 90-minute drive, we arrived in Kaziranga for an elephant-back safari. I sat astride Noonaimala as she ambled through the tall elephant grass, a little baby looking uncannily like Dumbo by her side. It was not the most comfortable way to travel, but meant we could get amazingly close to the rhino and deer. The elephant ride and a hasty breakfast over, we set out again, this time for a Jeep safari through the park. We saw more rhinos, deer and a couple of wild elephants, but it was December, a few months after the monsoon, so the grass was tall and the animals were well hidden. You’d see more in March and April, before the rains, when the land is parched and wildlife comes down to the plains in search of water. If anyone has heard of Assam, of course, it is because of tea. This was brought in from China by the British and Dutch in the 1700s, and is revered almost as much as Shiva and Vishnu. While the rest of India does a good impression of chaos and confusion, tea bushes are pristine, tended with love and neatly cut to waist level so the leaves are easy to pluck. It was while at lunch at a tea estate that I felt the urge to spice things up by trying the Bhoot Jalotia, the hottest chilli in the world. It sounded so impressive until our hosts let on that the Mexicans have bred one that is even more fiery. My five minutes of fame was dashed at a stroke. Ah well. I was still pretty chuffed that no one else dared take the challenge! Saga (0800 414 383; saga.co.uk/travel) packages a one-week cruise on the Mahabaahu with two nights in Kolkata from £2,349pp, departing 12 October 2017, including international and domestic ﬂights, UK and overseas transfers, Indian visa and travel insurance.